In 2017 Jeep launched the all-new Jeep Compass and it was a big hit. The new design had a new modern look, more features and new trims, including the addition of a Trailhawk trim. All of those changes made the Jeep Compass a bit ahead of its time and Jeep didn’t need to do much to bring the Compass up to speed for the 2018 model year. Here’s a closer look at the 2018 Jeep Compass lineup and all of its features. The 2018 model year includes the same four trims that were available in 2017, the Compass Sport, Compass Latitude, Compass Trailhawk and Compass Limited. While the 2018 Compass Trailhawk is still on available with a 4×4 drivetrain, the 2018 Compass Limited is now available with a 4×2 or a 4×4 drivetrain. All 2018 model year Compass trims are powered by a 180-horsepower 2.4-liter I-4 MultiAir engine. The Compass Tailhawk, Compass Limited 4×2 and 4×4, and Compass Latitude 4×2 come standard with ESS (engine start stop) technology, which helps to conserve fuel by turning off the engine when the engine is idling. Small and efficient, the Jeep Compass has an average fuel economy of 24 mpg in the city and 30 mpg on the highway. Depending on the trim, the Compass’s 2.4L engine comes standard with one of three transmissions, and buyers can upgrade transmissions as well. The Compass Latitude 4×4, and Compass Sport 4×2 and 4×4, come standard with a 6-speed manual transmission, but buyers can upgrade the Compass Sport 4×4 and Compass Latitude 4×4 with a 9-speed automatic transmission, and buyers can opt for an automatic 6-speed transmission on the Compass Sport 4×2. The Compass Latitude 4×2 and Compass Limited 4×2 come standard with a 6-speed automatic transmission and the Compass Trailhawk 4×4 and Compass Limited 4×4 come standard with a 9-speed automatic transmission. 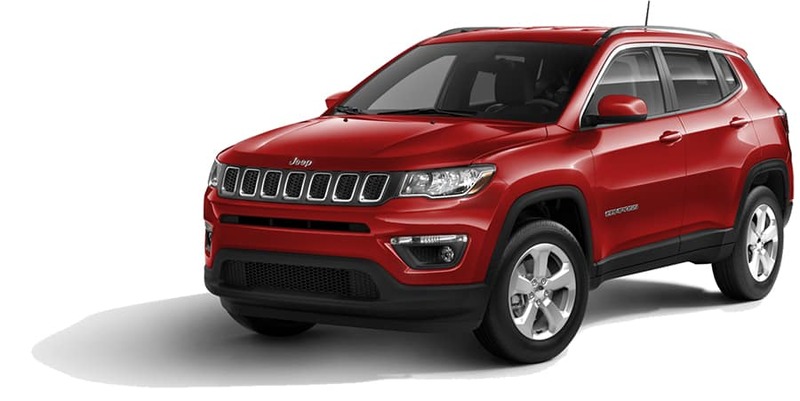 When redesigned in 2017, the Compass was given a great new look that made it look like a smaller version of the Jeep Grand Cherokee, and of course, all Compass trims have Jeep’s iconic seven-slot grille. Other exterior features that all Compass trims include a rear window defroster, heated and power adjustable exterior mirrors, and a push fuel filler door. Other exterior features, like wheels and exterior colors, vary from trim to trim. The Compass comes standard with 16-inch black steel wheels, and the Compass Latitude rides on 17-inch aluminum wheels and the Compass Limited rides on 18-inch aluminum rims. The Compass lineup has more than 10 different exterior color options, and some of the most unique colors are Laser Blue, Spitfire Orange and Olive Green. The Jeep Compass has a great interior set up. The Compass comfortably seats five passengers and there is 27.2 cubic feet of cargo space behind the second-row of seats, but if more space is needed for cargo, users can fold the second-row seat flat, which creates 59.3 cubic feet of cargo space. All Compass trims come standard with a 12-volt auxiliary port in the front and rear rows, cargo tie down loops and floor mats. The Compass Sport comes standard with cloth seating, the Compass Latitude comes standard with premium cloth seats and the Compass Limited comes standard with leather seating and heated front seats. All Compass trims feature integrated voice command with Bluetooth and they are all equipped with a touchscreen and Uconnect, which is FCA’s brand of infotainment systems. The Compass Sport and Latitude come standard with a 5-inch touchscreen and Uconnect 5.0 and the Compass Limited and Compass Trailhawk have an 8.4-inch touchscreen and Uconnect 4, which is compatible with Apple CarPlay and Android Auto. The 2018 Jeep Compass is backed by a three-year or 36,000-mile limited basic warranty and a five-year or 60,000-mile limited powertrain warranty. Additionally, Jeep includes roadside assistance for five years or 60,000 miles. The Jeep Compass is a very affordable SUV. The 2018 Jeep Compass Sport 4×2 has a starting MSRP of $20,995 (plus destination fee) and the same model with a 4×4 drivetrain has a starting MSRP of $22,495 (plus destination fee). Hollywood Chrysler Jeep is located just outside of Miami, and we have a great selection of Chrysler and Jeep vehicles. Visit us at Hollywood Chrysler Jeep for a test drive of the brand new Jeep Compass today.